Calling all DIY types… and anyone who just needs a room painted in their house. 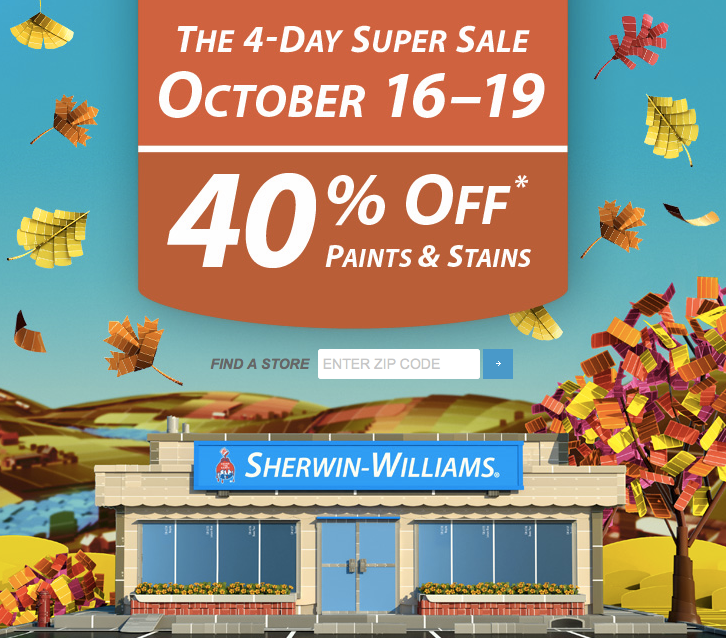 Starting today, October 16th thru Monday, October 19th, Sherwin Williams will be running their HUGE twice-a-year 40% off Paint Sale. Plus, get 30% off painting supplies (they have walls filled with Purdy brushes!) and 15% off wallpaper. Here’s the really awesome part: If you’re not ready to commit to colors quite yet, you can just buy plain white paint with your 40% off coupon. Then when you know what colors you need, bring your gallons back into Sherwin Williams and they will tint them for free for you! Last fall we painted (okay, fine, had painted) our kids’ rooms in the most gorgeous color — SeaSalt by Sherwin Williams. Sea salt is a great “neutral” color – it’s got undertones of grey, but they aren’t that sterile feeling grey that you can get sometimes. It will read more green or more blue depending on the light, time of day and even furnishings in the room. Kind of like a chameleon that way! See for yourself — these aren’t the best quality pictures, but isn’t it remarkable what paint (and some new bedding) has done for my daughter’s bedroom? !